There is no point posting what I wear each day of the week, unless you guys want to see my collection of hoodies?! At the moment it is so cold and especially as I leave home at 6.35am the weather is at it's most bitter, and basically suicide to wear anything other than jeans! I do have a tendency to exaggerate but no joke it felt like the cold was burning my face the other day, oh and Wednesday the sole of my foot went numb from the cold which was strange. And not to mention if I don't wear gloves a finger or two will go numb for a few hours. Bloody English weather. The best I can do is stock up on some thick tights but to be honest I prefer life to outfit diversity! The second picture was taken ages ago when my Mum found one of Gran's 80s ball dresses. It is too big for me sadly but still amazing, huge puffy sleeves, shoulder pads, about a ton of magenta netting underneath and the material is sort of metallic and shimmers pink/purple/dark green in the light! Lastly guess where I found my kittens sleeping? 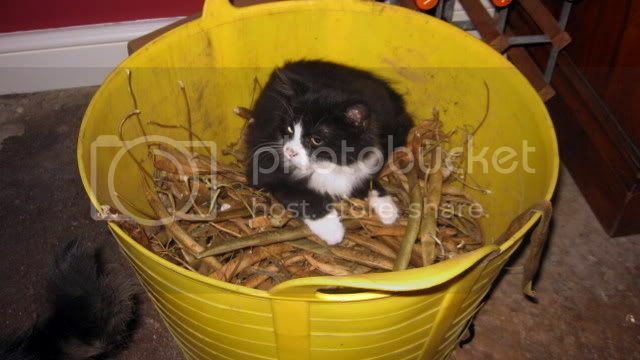 Sitting in a tub of dried bean pods...! Don't worry they have nice cosy baskets but for some reason crunchy dried pods are what they like (don't ask why there is a whole containerful of dried beans in my house, I don't know either). I'm off to play System of a Down and Tokio Hotel songs on guitar hero now, see you guys! ahha, i totally just wear hoodies during the week too - with my uniform. 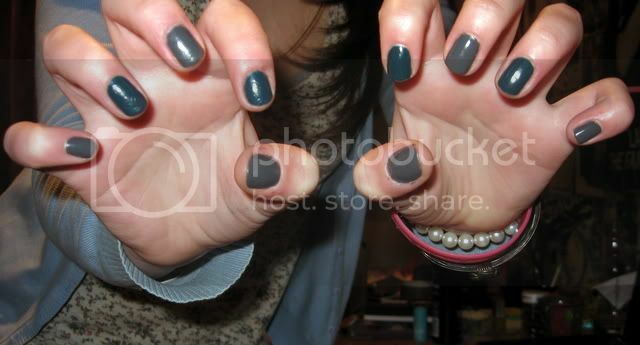 ah i love the colour of your nails! gorgeous! i need to invest in some dark colours, at the moment mines are a sort of navy blue. awwww your kittens are so cute! I especially love the outfit on the right and your hair looks beautiful there. Its so warm here in Australia at the moment so I definitely do not envy the cold weather. It must be so hard to get up that early in the morning. I kind of love your grandmas ball dress on you. You could totally alter it or something. You look cute, like a kid playing dress up! I love the last dress paired with those boots, really cute!